While Egypt did hold one of the turning point ground battles of World War Two, the Battle of El Alamein, a more over looked aspect of Egypt in the 2nd World War was its air force. Far back origins of the REAF date to 1928. Egyptian war ministry put out a call for volunteers and over 200 officers showed up. After rigorous physical and mental training, 3 were chosen. They were Abd El-Minuim Miquati, Ahmed Abd El-Raziq and Faud Abd El-Hamid. The 3 were sent to Abu Suwayer, an RAF airfield in Egypt near the Suez Canal for training. After success in this training, the trio was sent to Britain for further training. were ordered by Egypt. 5 of these aircraft would be delivered directly to Egypt via boat, but the other 5 were flown by the original Egyptian pilots who were in Britain. The 3 original aviators along with 2 other British pilots took off on the 23rd of May, 1932, from London and arrived almost 2 weeks later on June 2nd in Cairo. This was the first official flight of the Egyptian Army Air Force. The first commander of the EAAF was Canadian squadron leader Victor Herbert Tait. He spearheaded the expanding on the EAAF by ordering equipment, hiring staff, and building many new airfields all around Egypt. 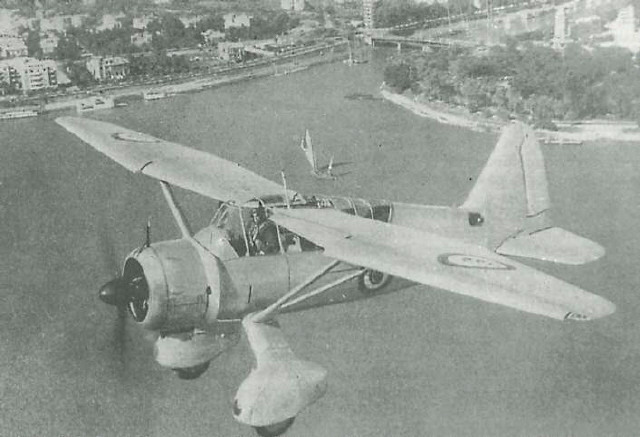 In 1934, 10 Avro-626s were delivered to Egypt to further strengthen their forces. By 1937, the Egyptian air force became independent from the army, creating the Royal Egyptian Air Force (REAF). In 1938, Egypt received 2 squadrons of Gloster Gladiator fighters from Britain, along with a squadron of Westland Lysanders. 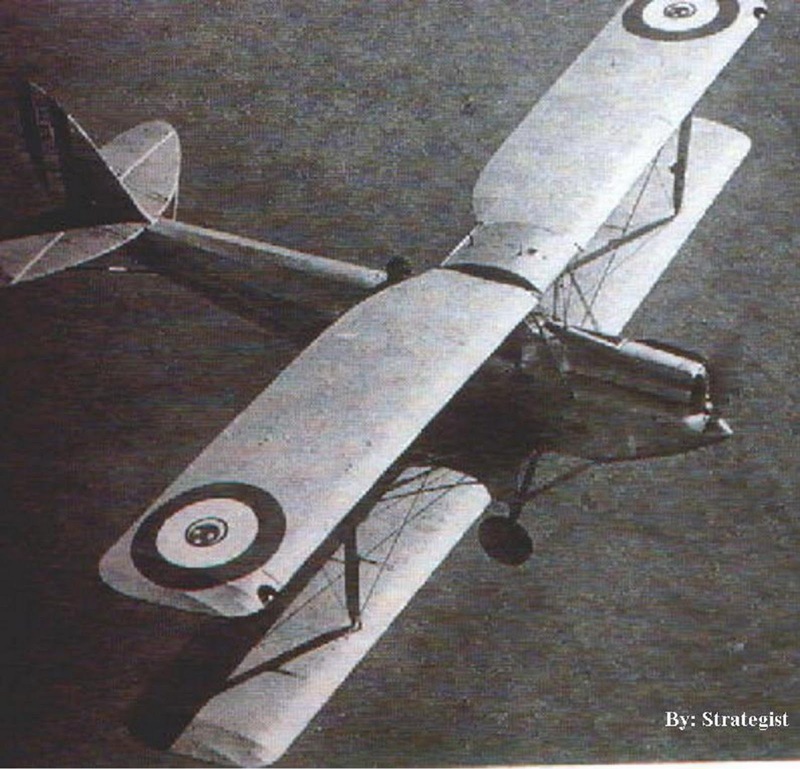 The Gladiators would be Egypt's first true fighter aircraft. An Egyptian Gloster Gladiator and Westland Lysander. The Gladiator was Egypt's first true fighter. The REAF's first test was in World War 2 during the invasion attempts from Italy and Germany. While the RAF did most of the heavy lifting in Egypt's airspace during that time, Egypt nevertheless managed to score their first confirmed kill on a German Heinkel He-111 bomber. The first war that the REAF officially participated in was the 1948 Arab-Israeli war. The REAF's roles were minimal, mostly limited to naval and ground support. Egyptian Spitfires did make few attacks but most were failures and resulted in Egyptian losses. During this war however, in 1949, Egypt received its first jet fighters, the Gloster Meteor F.4 and the De Havilland Vampire FB.5, as well as upgrading its Spitfire Mk.IXs to Spitfire Mk.22s. Egyptian Gloster Meteors, Egypt's first jet fighters. After 1952 and the revolution, Egypt moved away from British reliance for arms and aircraft, looking towards the Soviet Union for supplies. Egypt accquired IL-28 jet bombers and MiG-15 jet fighters from the Soviets. Egyptian IL-28 Beagle. This was Egypt's first jet bomber. Today, the Egyptian Air Force is revered as the strongest air force in the Arab world, and 2nd only to the Israeli air force in the Middle East. They operate a wide range of modern fighters such as the Mirage V, MiG-21, and the F-16 Fighting Falcon. Egyptian Air Force F-16s. F-16s are the main fighters of the Egyptian Air Force. Interests:Gaming and absolutely anything military. Thank you for this, good job! I wonder if we get some day Arab-Israeli War events. 1948 match timeline. Probably not, for political reasons. However we should at least get a nice desert map. So we should kick out Alternate Berlin and Korea, because USA/NATO and Russia have problem with Ukraine? Or Korea, because officially there is still war? Or Japan vs Russia or China, because there are tension too? Daaaammmnnn.. That 109 looks ugly like.. What the hell did Israeli do to it? This is Avia S-199. Those were built in Czechoslovakia It was constructed with parts and plans left over from Luftwaffe aircraft production that had taken place under the country's German occupation during the war. It's a Bf 109 airframe and the aircraft used the same engine (Junkers Jumo 211 F) and propeller as the Heinkel He 111 bomber... It wasn't good for performance. Yeah, you really need to quote wall of text to write 3 words. I'm a little sheepish to say at this point that my father was involved against the Egyptians during the Yemeni Civil War and the Aden conflict as a member of the RAF, but in this modern day it is certainly fascinating to read the Egyptian perspective in your article. Thank you for this, I love reading about other air forces. Egyptian Airforce- especially armed forces under Nasser prior to Anwar Sadat being gunned down: Heroic. Utterly annihilated the Israelis in the Yom Kippur War especially with their brilliant deception campaign, outsmarting the allegedly unbeatable Mossad and Agaf HaModi'in. Western propaganda to this day does not admit Israeli total theatre defeat and the Egyptian and Soviet aces made in that period. Egypt- Muslim nation guarding innumerable sites of Universal human significance- world's treasures of Pyramids, Luxor, etc: Former centre of the Islamic analogue of the Vatican- hopefully very soon again. In the Sinai- Oldest Christian Monastery: St Catherine''s Monastery of the Burning Bush, Sinai Desert- built on the site the Moses recieved instructions forom God- a Holy place of pilgrimmage and worship to all 3 Abrahamic relgions- judaism, Christianity and Islam. Protected by direct decree by Prophet Muhammed (SAW). St. Catherine's has been guarded by Egyptian Muslims since founding of Islam, "For the people here, the monastery is everything," Mohamed Khadr activist with the Community Foundation for South Sinai, a support group for locals (all religions) "We grew up with the monastery – it's our history, our roots." Soekarno, Nasser, Tito- founders of Non Aligned Movement aka CONEFO- Conference of Emerging Forcdes. Viva anti-koloniaslime! Great article! We still operate late MiGs as well, they're pretty well maintained. Actually, the REAF played a very important role and flew hundreds of combat sorties (not only a 'few'). Stating something like 'most were failures and resulted in Egyptian losses' is simply 'buying Israeli propaganda'. Sufficient to say: I've got a copy of the official war diary of the REAF's Eastern Command for period July-December 1948, and it shows around hundreds of combat sorties flown (something like 10 sorties a day on average, with up to 30 on specific days). Considering the technical state of aircraft, and British embargo on export of spares and ammo, that's unsurprising. Nevertheless, the REAF managed to return to service a number of older Spits during this period, and used these to replace the few losses in late-mark modells too. Furthermore, the same War Diary shows that nearly 50% of Israeli claims for that period are nothing else but that, 'claims', i.e. that the REAF suffered no related losses. Classic example would be the first two Israeli claims for two REAF Dakota-bombers supposedly shot down by Modi Allon (in Avia S.199) over Tel Aviv. Actually, only one C-47 was damaged; it made an emergency landing near what is now Gaza Strip, the crew repaired the plane and then flew it back to base. It was also not so that the REAF has got any jets during that war. Due to British and US embargos, this was completely out of question. First jets arrived only after the end of hostilities, in 1949. After 1952 and the revolution, Egypt moved away from British reliance for arms and aircraft, looking towards the Soviet Union for supplies. After the revolution of 1952, Egypt wanted British troops to leave their bases along the Suez Canal. Because of this, London imposed a new arms embargo. How should have Cairo continued buying British aircraft if British were refusing to deliver any? Nasser then turned to the USA: Washington conditioned any arms supplies with Egypt granting basing rights for US troops. How should have Cairo permitted basing rights for US troops, when it was doing whatever was possible to finally get rid of the British? Result: there was no other solution but for Egypt to turn to Czechoslovakia - not to the USSR - as a new arms supplier. That's how first MiGs arrived in Egypt, in 1955. Egypt accquired IL-28 jet bombers and MiG-15 jet fighters from the Soviets. All the MiG-15s and MiG-17s ordered and delivered in 1955-1957 period came from Czechoslovak production. Il-28s were Soviet-built, but purchased via Czechoslovakia too. For precise details about related developments, negotiations, orders, deliveries, training of Egyptian pilots in Czechoslovakia etc., see books from [url=http://www.amazon.com/ARAB-MIGS-VOL-1955-1967-Gurevich/dp/0982553927/ref=sr_1_35?s=books&ie=UTF8&qid=1422434949&sr=1-35]Arab MiGs[/url] series, all based on official documentation and interviews with dozens (if not hundreds) of participants. Don't know where this is from, but when one asks Arabs, 'everybody knows' it's the Royal Saudi Air Force that's - by large and far - the largest and best equipped. Indeed, when one asks Saudis, the situation is such that: a) because they have defeated the Houthi insurgents in Yemen, whom they consider as 'Hezbollah-trained', and b) because Saudis are convinced that Hezbollah 'defeated Israel' durign the Lebanon War of 2006, it's so that c) 'Saudis are better than the Israelis'. This probably sounds weird to most of people who are going to read this, but that's how they think. Sorry mate, but nobody was 'anihiliated' during the October 1973 War (aka Yom Kippur/Ramadan/Teshreen War): Egyptians and Syrians took the Israelis by surprise. Egyptians crossed the Suez Canal and defeated all Israeli counterattacks. Syrians re-captured nearly half the Golan Heights destroying two Israeli armoured brigades in the process, then causing extensive losses to the Israeli AF. But, subsequently the Israelis recovered from the shock of surprise and losses, and - bolstered by urgent deliveries of new arms and ammo from the USA - counterattacked. They advanced into Syria, causing heavy losses to the SyAAF; they crossed the Suez Canal and - thanks to repeated violations of UN-negotiated ceasefires - encircled the Egyptian Third Field Army. While Arabs suffered heavier losses than Israel, Israel suffered more massive economic damage, but the overall outcome of the war was a 'draw' at best. Though what made that war as 'successful' for the Arabs in military sense was the fact that they proved they could re-conquer their soil from Israeli occuppation. More importantly, that war has to be seen through Clausewitz's definition of 'War is continuation of politics through other means'. In this regards, Arabs can be considered as 'victorious' because Israel was subsequently forced to give up the Sinai (althought even this took another ten years), and a thin strip on eastern side of the Golan Heights. No 'winner' is giving up any grounds. All the MiG-15s and MiG-17s ordered and delivered in 1955-1957 period came from Czechoslovak production. Il-28s were Soviet-built, but purchased via Czechoslovakia too. For precise details about related developments, negotiations, orders, deliveries, training of Egyptian pilots in Czechoslovakia etc., see books from Arab MiGs series, all based on official documentation and interviews with dozens (if not hundreds) of participants. You've struck my attention. Are you Egyptian yourself? Either way I'd like to see your sources. As an Egyptian myself, I'd love to learn more. Feel free to pm me. Most of the info I put in here was from Internet research. Add me in the PM aswell, I am interested.